Glenavon celebrate an equaliser off the penalty spot against Glentoran. Pic by Pacemaker. 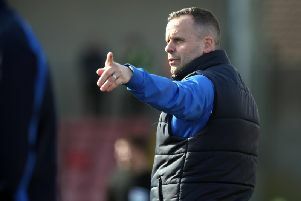 It proved honours even at Mourneview Park on an afternoon of limited sights of goal as Glentoran broke the deadlock before Glenavon battled back off the penalty spot. A first half of few scoring opportunities was dominated by a Glentoran set-piece threat off John McGuigan. Play lacked tempo across both camps but the visitors suggested the greater early edge, with a Dylan King block in the box deflecting over McGuigan’s effort. Caolan Marron then stepped in to get his body between John Herron’s drive and the target. Glenavon struggled to test Elliot Morris on his landmark 700th appearance between the Glens posts. Glentoran grabbed control on the hour mark as Ross Redman’s corner-kick was glanced home by Robbie McDaid. Glenavon’s response proved encouraging and hesitation from Morris, Willie Garrett and Redman in the box eventually led to a foul on Andrew Mitchell. Stephen Murray, following a long delay, left it level from the spot. A Rhys Marshall block prevented McGuigan from firing goalwards, with brilliant skill by Mark Sykes but his shot just wide. GLENAVON: Tuffey, Marron, Daniels, Marshall, Mitchell (Jenkins, 74), Sykes, Hall, Donnelly (Murray, 46), Harmon (Doherty, 61), King, Singleton. Subs (not used): Hamilton, Taylor, Larmour, Muir. GLENTORAN: Morris, Garrett, Kane, Birney, Herron (Davidson, 63), Allen (Byrne, 83), McGuigan (McMahon, 90), McDaid, Crowe, Gordon, Redman. Subs (not used): Nelson, Kerr, Ferrin, McCarthy.